If you shop at your local farmers' market...or are a member of a CSA...right about now your refrigerator is filled to overflowing with greens.... Spinach, arugula, young kale, chard... lettuces of all kinds...beet greens... Just to name a few. A salad....or a side of braised or wilted greens...are fine uses for this abundance, but the world of greens really does have so much more to offer. With this in mind, this Spring I offered a class on some of the ways you can use these greens that are filling the market right now. Four of the recipes in my class have already appeared here on my blog...Spinach Pasta, Arugula Pesto, Kale and Ham Quiche and Spinach Meatloaf. I probably could have pulled one more recipe from something I have already posted (a quick count revealed more than 40 such posts....who knew I loved greens so much? ), but in the end I settled on a recipe that held some nostalgic appeal for me...and at the same time struck me as something that might be unfamiliar to some: Ravioli Nudi. 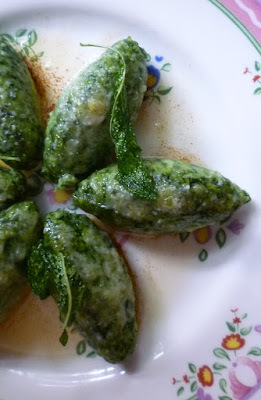 I first encountered Ravioli Nudi when I was just becoming interested in food and cooking. I was enrolled in a series of cooking classes that featured the food of ten local chefs. Each class was in a different restaurant kitchen and was taught by the chef. Twenty-four hour food TV had not yet been invented (at least, not to my knowledge...) and the culture of the celebrity chef was in its infancy....so the classes were small and intimate and very low key. It was a wonderful experience...one that could probably not be recreated in quite the same way today. Both series I attended included a class taught by Chef Steve Cole at his restaurant Café Allegro. Not only did he cook for us in his restaurant kitchen, but during the second series he took us to the Farmers' Market where he introduced us to some of his favorite growers and gave us a quick tutorial on navigating the market. That day was a first for me...I was totally enamored with the market. The things I learned about the market that morning have stayed with me for all of my professional life. Much of what I learned showed up in one of my first blog posts (appropriately called "Navigating the Farmers' Market"). 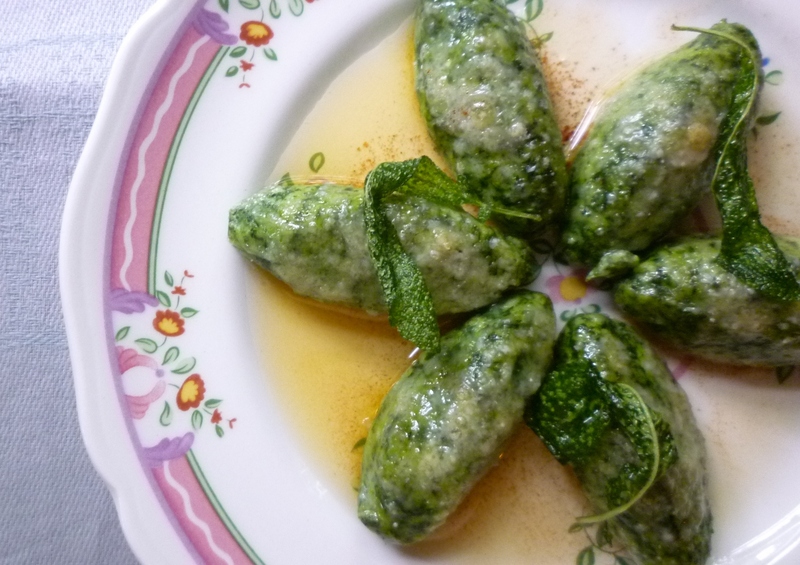 When we returned to the restaurant, one of the things he made for us was a delicious, tender, pillow-y little spinach and ricotta dumpling called Ravioli Nudi. The name "Ravioli Nudi" comes from the fact that this little dumpling is basically a ravioli of greens and ricotta....without the pasta covering.... It is a "naked" ravioli. When I worked in the south of France, there was a restaurant in Biot that served the same thing...Ravioli "Nu", in French. The same dish is sometimes called Spinach & Ricotta Gnocchi (focusing on the fact that it is really just a little dumpling....and rather gnocchi-like). And I think most commonly of all, it is called Gnudi....which I'm guessing is a name that has evolved from Gnocchi and Nudi. No matter what you call it, when properly made, it is delicious. When I began working on my class I pulled my recipe from that long ago class thinking it would be "class ready". Unfortunately, it was not. I had not done a great job of taking notes...and frankly didn't have enough knowledge at the time to ask questions that would really help me replicate Chef Cole's results. It called for "3 lbs spinach – picked and washed". Today I would know to ask for a net weight of greens. Spinach varieties vary widely in how ropey or delicate the stems are...and therefore how much weight will remain after the stems are removed. Since I had promised to teach Ravioli Nudi made with Swiss Chard (instead of spinach), a net weight of greens was what I really needed...not a pre-trim weight. Poking around the web to look at other recipes wasn't particularly helpful. The list of ingredients from recipe to recipe was quite consistent...basically greens (usually spinach or chard), ricotta, parmesan, eggs and flour. But the ratios of these ingredients to one another were all over the map...and absolutely no one gave a net weight of greens. Furthermore, there seemed to be a divide between gnudi made with whole eggs and those made with just the yolks. All of these differences presented me with somewhat of a daunting task. Quality of gnocchi-like preparations varies widely....often these things are horrid little belly bombs...heavy and doughy... Chef Cole's ravioli nudi had been the antithesis of this...and I wanted to present something like what I had experienced in his class to my class. As always, in the course of researching and testing my recipe, I learned a lot. Firstly, the greens and the ricotta must be as dry as you are able to make them. This means the ricotta you use must be of a high quality (preferably one that contains just milk, vinegar and salt) and you will probably have to drain it even further (even if it looks well-drained) by placing it in a cheesecloth-lined sieve and letting it drain overnight. I found a helpful tip in Judy Rodgers Zuni Café Cookbook for assessing whether or not you need to drain the ricotta: Place a small spoonful of ricotta on a dry paper towel. If, after a minute, the towel is wet beyond the perimeter of the spoonful of cheese, then it is too wet and needs to be drained. As far as the greens are concerned, "as dry as possible" means not only squeezing them dry a handful at a time (which is sufficient for most other preparations...like spinach pasta...a grain pilaf....or a quiche...), but going a further step and squeezing out even more water by rolling the greens up in a towel and wringing out as much water as you are able. This process will turn the towel green (or pink, if using red chard or beet greens), but a vigorous rinse in cold water will remove most of the color....and normal washing will probably get the rest. The reason I belabor all of this is that the drier the ricotta and the greens are, the less flour that you will need to add to obtain a dough that can be lightly handled and that will hold a shape. And the less flour you use, the lighter will be your result. A lot of flour creates the heavy, belly bomb gnudi mentioned earlier. Another thing I learned while working on the recipe is that I prefer gnudi made with all egg yolks. This is what Steve Cole's recipe called for, but since I noticed that a lot of recipes used whole eggs, I gave that a try too. The gnudi made with whole eggs seemed slightly rubbery to me....but they were also more stable. In the recipe, I direct you to save the whites when you separate the eggs so that you may add a bit of the white back into the dough if you discover that a "tester" gnudi shows a tendency to fall apart in the water during cooking. All of the details of this recipe may seem a bit tedious, but if you love dumpling-type preparations, I encourage you to give them a try. Much of the prep can be done ahead. The greens may be cooked and dried ahead....and of course the ricotta can be drained overnight. After these two things are accomplished, the dough comes together very quickly. The gnudi themselves can be formed several hours ahead. They can even be frozen. And since they are at their best when served quite simply, all your effort can be focused on making the gnudi. Served in a pool of fresh tomato sauce....or a white wine cream sauce (embellished with a few spring vegetables, if you like)...they make a delicious dinner. And for an elegant first course for a dinner party, a drizzle of sage-infused browned butter...or plain olive oil...and a scattering of Parmesan....is all you need. Prepare the greens: Bring a large pot of water to the boil. Add the greens and simmer until very tender—depending on the green you are using this will take 5 minutes or so. Scoop the greens out of the water and place them in a colander to allow most of the excess water to drain. Spread the drained greens on a baking sheet and allow them to cool. When cool, pick up small handfuls of the greens and squeeze out most of the water. Spread the handfuls of greens in a kitchen towel and twist/squeeze the towel to remove as much of the remaining liquid as you are able. (The towel will be stained green—possibly red, if using red chard—by this operation. The color will come out with a rinse under cold water and a good wash...but just in case, don't use a good kitchen towel...a flour sack towel is perfect.) The more liquid you are able to squeeze out, the lighter your gnudi will be. Scrape the dry greens off of the towel and onto a cutting board and mince finely. Set aside (refrigerating for longer storage) until ready to use. Make the dough: Place the drained ricotta in a bowl and beat with rubber spatula to smooth it out. Add the greens, Parmesan and seasonings and beat until well combined. Beat in the yolks. Add 2 T. of the flour and stir just until the flour is absorbed. If the dough is too soft to form a soft ball that can be handled gently with floured fingers, add another tablespoon or so of flour. The less flour you add, the lighter your gnudi will be. Test the dough: Bring a pan of salted water to a bare simmer. Form, flour and add one gnudi. If it falls apart in the water, add a tablespoon or so of the reserved egg white to the dough and test again. Form the gnudi: You may form the gnudi in any number of ways. Some people pipe them in strips on a floured board and cut them into short "corks"... others scoop with a small cookie scoop and then form a ball.... I like to use two teaspoons to form a rough quenelle by scooping up a small amount of the dough (10 to 12 grams or so) with one spoon and then passing it back and forth between the two spoons to form a football shape. 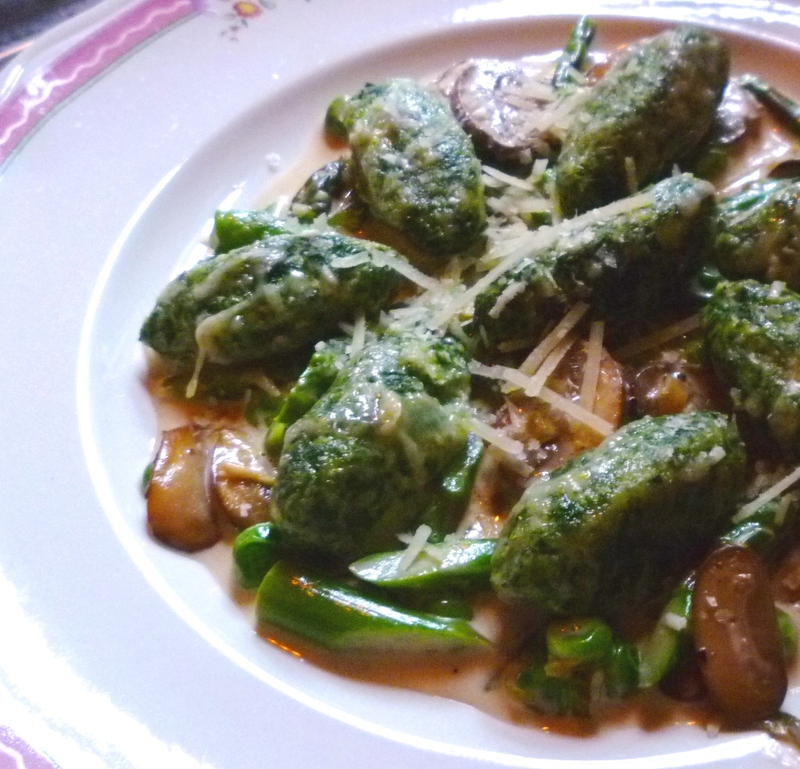 Drop the gnudi as you form them, a few at a time, into a dish of flour. and then gently pick them up and lightly roll in your floured fingers to give a coating of just a dusting of flour. Place the formed and dusted gnudi on a pan that has been dusted with semolina (all purpose flour will work in a pinch...but semolina is a better option.) The gnudi may be cooked right away...or held at a cool room temperature for a short while...or refrigerated for several hours. Cook the gnudi: Bring a large pot of well salted water to a bare simmer (a boil will encourage the gnudi to fall apart/explode in the water). Add half of the gnudi and give the pot a gentle back and forth shake to make sure the gnudi aren't sticking to the bottom. Monitor the pot to make sure a gentle simmer is maintained. The gnudi will begin to bob to the surface. Begin checking them for doneness a couple of minutes after they float to the top and remain on the surface. They are done when they go from feeling squishy to springy to the touch. Using a mesh skimmer/sieve, lift the cooked gnudi out of the water, transferring them to an oiled baking dish that is large enough to hold all of them in a loose single layer. Poach the remaining gnudi and add them to the dish. Serve the gnudi right away...or hold at room temperature for an hour or so. If serving right away, they may be spooned directly onto a plate of sauce or broiled. If held for service, it is best to reheat them by broiling them. To broil, drizzle the gnudi with oil or dot with butter and sprinkle with Parmesan. Run the pan of gnudi under the broiler until the cheese is lightly browned and bubbling. The gnudi may be sauced with a drizzle of browned butter (infused with sage or thyme) or a light butter sauce. They may also be served in a pool of tomato or cream sauce. Recipe makes 32 to 40 gnudi, serving 4 as a light entrée or 6 to 8 as an appetizer. To freeze: Place the pan of formed gnudi (they should be in a pan dusted with semolina and they should not touch one another) in the freezer. When the gnudi are frozen, wrap tightly with plastic wrap. When ready to cook, unwrap and set in a cool place (or in the refrigerator) and thaw...this should only take about an hour. Cook as for fresh within 10 to 14 days. You may use any green that you like in this recipe. The amount given is the trimmed weight. You will need to purchase more than this because of trim loss. A standard 1/2 lb. bunch of chard will yield about 6 oz. of greens, so for this recipe you will need 2 bunches. When cooked and squeezed dry, you should have 3 1/2 to 4 oz. of very dry cooked greens...or a scant cup. Spinach (particularly baby spinach) has, in my experience, shrunk more in weight during the cooking process than chard or beet greens. To obtain the same 3 1/2 to 4 oz. of very dry cooked greens, you will need to start with a pound of trimmed spinach. Even good quality ricottas will probably need to be drained. My favorite ricotta (Hautly) appears to be quite dry right out of the container, but when allowed to drain in a cheesecloth overnight (set in a strainer, suspended over a bowl), I found that about 10 percent of the weight of the cheese was whey...for 8 oz., this is a couple tablespoons of liquid—which is a significant amount in this recipe. You will need 8 oz. of drained ricotta for the gnudi. In general, 8 oz. of ricotta requires 40 to 50 grams of egg to bind it for successful poaching. One whole egg weighs 50 grams and two yolks weigh 40 grams. You may use a whole egg instead of two yolks in this recipe, but I find the resulting dumpling to be much lighter when made with all yolks. Because using yolks will give you slightly less egg than a whole egg, when you separate the eggs, save your whites—you might need them. After you have made your dough, cook a tester before forming them all. If it seems to want to break apart in the water, you can add a small amount of the whites back in to the dough. If you double the recipe, consider adding an extra yolk (5 all day...5 yolks equal the weight of 2 whole eggs). The less flour you use, the lighter your gnudi will be. Start with 2 T. (15 grams). If the dough is still too soft to handle, add another one or two tablespoons.